This is a upgraded fan heater control switch designed with heat sink that will ensures a better heat dissipation. Universal fit for 12V or 24V, supports high power, 120W@12V, 240W@24V. Continuously variable type, the rated thermal current is 10A. Easy to wire, convenient to use, it is a great replacement for broken ones. Widely used for adjusting speed of automobile fan heater, defroster, fans, etc. ADVANTAGE:it will ensures a better heat dissipation It is a upgraded fan heater control switch designed with heat sink. .Feature:Advanced potentiometer enables you adjust power output easily. It feels smooth and has good durability. INSTRUCTIONS:universal fit for 12V or 24V, supports high power, 120W@12V, 240W@24V. NOTE:The rated thermal current is 10A. 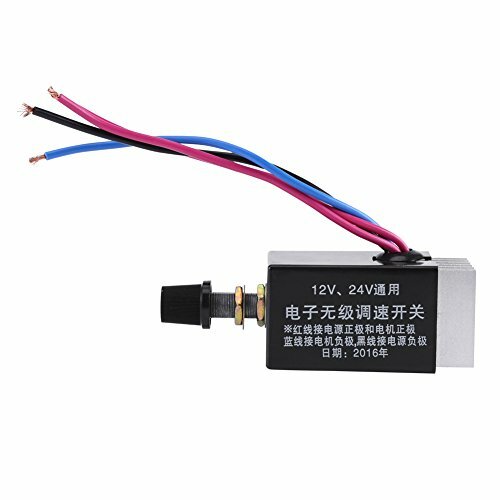 WIDELY APPLICATION:it is be used to help regulate the motor speed,also widely used for adjusting speed of automobile fan heater, defroster, fans, etc.easy to control and operate.